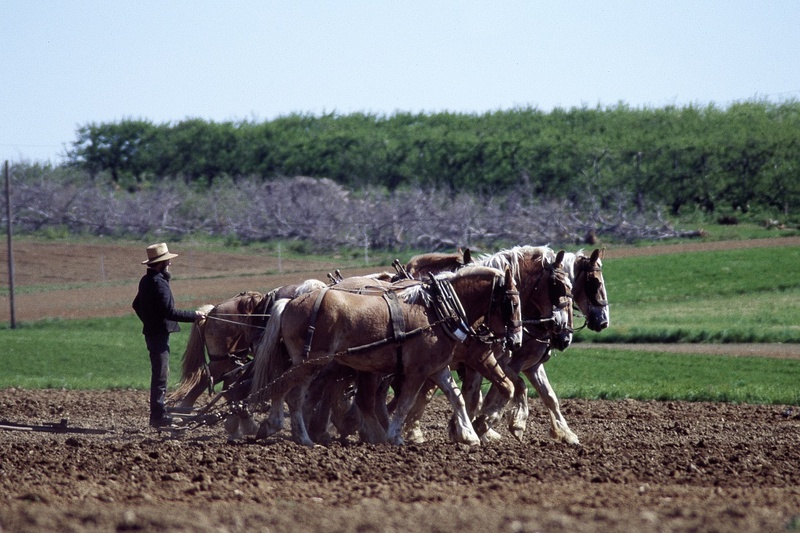 Near Strasburg, Lancaster County, Pennsylvania - August 1978 - afternoon: Three Amish men were working in their field when a odd looking man approached them from the direction of a neighboring farm. The man was yelling and jumping about. The Amish men were alarmed and noticed that this 'man' had arms, legs and a face that seemed different...more animal than human. He had coarse dark hair on his limbs and face and wore what appeared to be a dark colored and tattered pair of old style boxer shorts. As the man-creature approached closer, he was yelling something but it was not understood by the men. The men ran towards their house...the man-creature was right behind them. One of the Amish men ducked into the dairy barn and the other two immediately went in the house. An elderly Amish woman who had been in the garden, came to see what was going on. When the man-creature saw her it suddenly stopped running, sat down on the grass and remained quiet while staring at the sky. The men came out of the house and one of them slowly walked over to the man-creature and attempted to talk to it. The man-creature continued to look at the sky but started to mumble. The man and woman noticed that a horrible stench permeated from this creature...described at rotting flesh. After several minutes, the creature got to it's feet and started to walk towards the dairy barn. As it did, the witnesses noticed that the creature started to 'fade away'...eventually it completely disappeared from view just before it reached the barn. Shocked, the Amish witnesses dropped to their knees...not knowing what they had witnessed. NOTE: this account was communicated by one of the witnesses to a non-Amish friend who periodically purchased produce from them. It was disclosed to me several years after the incident, but I do know the location of the incident and who two of the witnesses were (I was raised in the general area). The other witnesses have since passed away. The witness who gave the account still lives at the location and has (reluctantly) verified the incident to me. In turn, I promised to keep personal information confidential. Historically, Wild Men and/or Bigfoot-like creatures have become part of the Lancaster / York County folklore. There have been sightings as old as the earliest settlers in this area, as well as the Shawnee & Susquehannock people who inhabited the land previously. Massillon, OH - 2014-08-11 - 6:14PM: I'm going to say I did not believe in alien abduction before this happened. I know it wasnt a dream. I was at home. Laying in my bed writing a song. I was really depressed and didn't know why I was still alive what was my purpose. I wasn't tired or anything but I guess I must have fell asleep or something because the next thing I know Im laying on a bed. It was hard and felt like metal under my body. I was naked. I could only turn my head a little looking around I see beings gray but not short they were tall Id say around 6ft. They had eyes the shape of almonds. They had no clothing on. they didnt walk they moved so smoothly. I started to panic because 3 of them started towards me. All of the sudden I get this voice in my head to turn my head to the right. as im turning my head above me are these tubes the werent hard but like rubber that wiggled. As i finished turning my head standing beside me was this tall being. His head was gray he had almond shaped eyes but his body was like liquid universe. he told me not to be afraid, but he didnt speak it. It was like he was in my head speaking. all of the sudden i get this sharp burning pain in my left ankle. I tried to moved i tried to do something but i was being held down by some force or maybe paralyzed. Again this main being came right over me and looked down at me I could feel tears going down my face. In my head I spoke why is this happening. He like smiled but i didnt see the smile I felt it. He told me that I needed to tell them something. I cant remember what Im suppose to tell and I dont know who Im suppose to tell it to. After that my head snapped to where I was looking up at these hanging tubes. One of them started to slowly come down towards me. As it got to my right eye it went from limp and soft to hard and it had a point like a needle. As the needle type tube was about to enter my right eye the main being put his hand on my forehead. The next thing I know I wake up and Im looking out into space. Im in a smaller ufo looking at the main UfO. But it was all hazy like I was drugged. The windows on the big cigar shaped UFO looked like swirling water. The next thing I know Im laying back in my bed two hours later. My left ankle felt like it was on fire i put my hand down there and felt a mark. it was diamond shaped. It looked like it had already started healing as a scar. For the next week I had a hard time walking on that foot. It felt like something was burning inside my ankle. Its now 2016 I still have the diamond shaped scar but its very light. I dont know what they did when the stuck that tube needle into my eye. I really want to find a way to remember what I am suppose to tell then, whom ever them is. ever since this I have become a recluse. I want to now what happened to me that night and why they did these things to me. 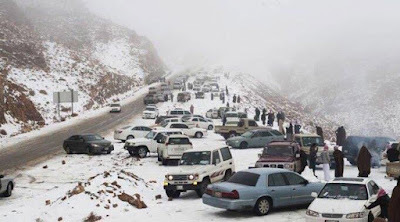 It's not every day that powdery snow covers the desert sand in Saudi Arabia – but that's exactly what happened to parts of the country when temperatures dropped below freezing. Saudis are reacting with a healthy dose of humor, and even a few snowmen. 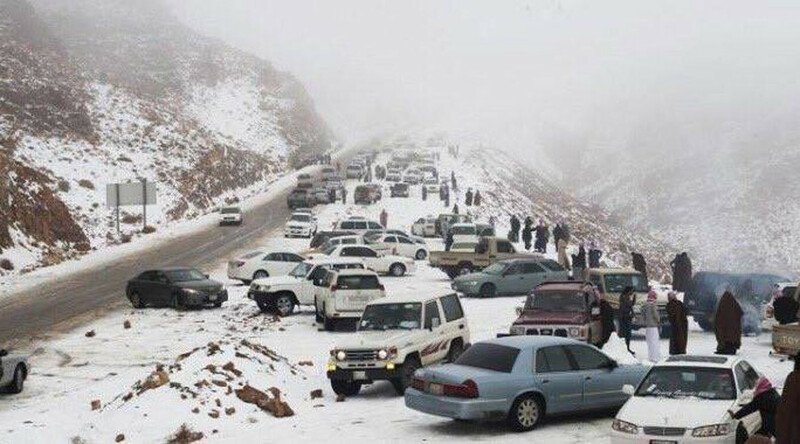 The frigid temperatures and blanket of snow is an unexpected treat for Saudi Arabia's central and northwest regions, which tend to see daily high temperatures of around 20° C (68° F), even in the November "cold season." Near Orlinda, Tennessee - July 14, 1996 - 1:00am: A family of four was suddenly awakened by weird noises coming from the trailer's backyard deck. Grabbing a flashlight, the father went to investigate. Sliding the door open he illuminated the deck's wooden railing. he then heard a noise that sounded like "something running across the deck, bumping into things." The noise startled him. Neither of his dogs had barked at the intruder. Shining his flashlight toward the railing, he saw something rear up, and stare at him between the rails. He described it as a kind of rubbery or pulpy object five feet in diameter. It extended a tentacle or appendage through the railing and onto the deck floor. The witness estimated the appendage was "18 to 24 inches long" resembling an elephant's trunk.